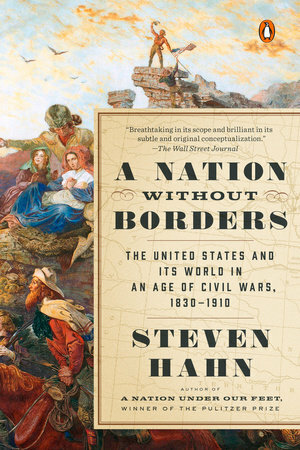 • A Nation Without Borders: The United States and Its World in an Age of Civil Wars, 1830-1910 by Steven Hahn (Penguin Random House, 2017). A Nation Without Borders is the third volume in The Penguin History of the United States series (edited by Eric Foner). This is the paperback reprint of Hahn's book, which was originally published in 2016. Hahn's book "takes on the conventional histories of the nineteenth century" and is self-described as controversial. "It begins and ends in Mexico and, throughout, is internationalist in orientation. It challenges the political narrative of “sectionalism,” emphasizing the national footing of slavery and the struggle between the northeast and Mississippi Valley for continental supremacy. It places the Civil War in the context of many domestic rebellions against state authority, including those of Native Americans. It fully incorporates the trans-Mississippi west, suggesting the importance of the Pacific to the imperial vision of political leaders and of the west as a proving ground for later imperial projects overseas. It reconfigures the history of capitalism, insisting on the centrality of state formation and slave emancipation to its consolidation. And it identifies a sweeping era of “reconstructions” in the late-nineteenth and early twentieth centuries that simultaneously laid the foundations for corporate liberalism and social democracy." More from the description: "From an agricultural society with a weak central government, the United States became an urban and industrial society in which government assumed a greater and greater role in the framing of social and economic life. As the book ends, the United States, now a global economic and political power, encounters massive warfare between imperial powers in Europe and a massive revolution on its southern border―the remarkable Mexican Revolution―which together brought the nineteenth century to a close while marking the important themes of the twentieth."